Chicken Jalfrezi with Bone / Chicken Jhalfry is a very taste dish. You can change the spice level up to your taste. ENJOY. When you are cutting tomato, remove seed and then dice it. Take a large pan or wok and heat oil: Then add onion and fry 2-3 minutes until the onions are translucent and browned lightly. Then add coriander powder, cumin, turmeric and let fry for 1 minute. Add chicken pieces with garlic, ginger, black pepper and 1 teaspoon salt; fry for 15 minutes or until chicken becomes half cooked. If needed you can add 1 tablespoon water at a time to keep the sauce from burning/sticking to bottom of pan. Now add chopped tomatoes and cook for five or so minutes. Add mustard paste and capsicum and mix well. We want the sauce thick but not to burn, so if needed add 1 tablespoon water at a time. Stirring occasionally and when chicken is cooked and gravy thick enough, add chopped coriander leaf and sugar. Give a good stir and remove from heat. 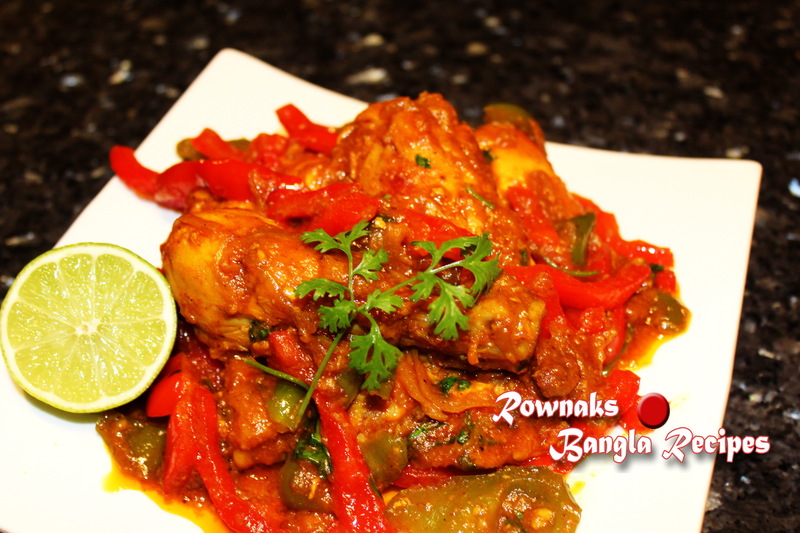 Enjoy yummy Chicken Jalfrezi with Bone / Chicken Jhalfry.